This is what I was afraid would happen. I have good intentions to post and then days get by me for one reason or another. Still waiting on the surgery for my implant. The trial was successful but insurance gets to call the plays. We have been trying to find something to keep me on my feet in our 90+ weather. This is St. Mary's Cathedral Basilica. To think that I live about 20 minutes from this sacred space and never realized it. I spent about an hour and need to go back for more. 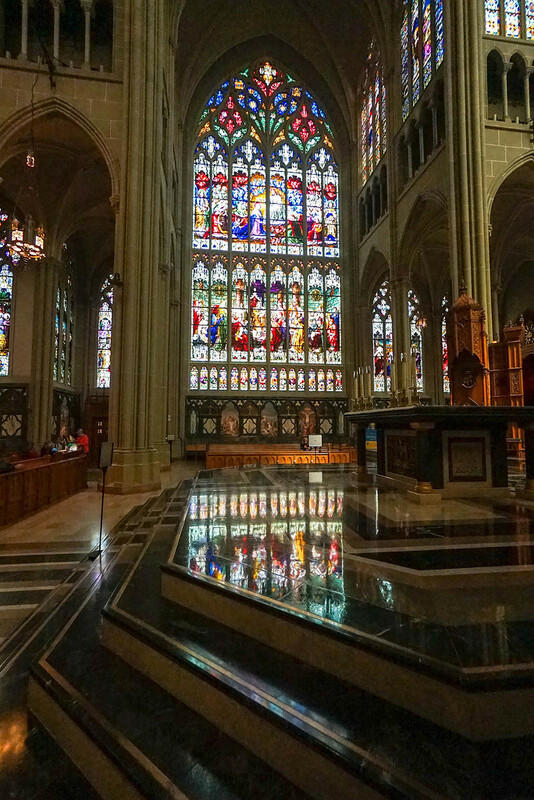 This is one of the largest stained glass windows in the world. Such a beautiful window. Great reflections. Beautiful picture and I love your caption with the double meaning of defections. This is absolutely gorgeous! The clarity of your photo is amazing and it speaks to the serenity of the subject. Oh my that's beautiful, what is the reflection in? @30pics4jackiesdiamond is in the marble floor. No matter where you look it is so very gorgeous. Thought I was following you but find out I wasn't. Glad to see you are back. This is tremendous - the reflection being double the amount of colourful window! Gorgeous! I posted some photos from there in March. Such a stunning church. Great composition and beautiful reflections. Great composition on those lovely stained glass! Well spotted and a wonderful capture. Beautiful stained glass, too. Beautiful colours and reflection - and a great shot in low light too. merry Christmas, cathy, and all the best for 2019! @grammyn I am doing pretty well. I have a new little computer that lives in my back and is giving me major relief. So I am learning how to live with that and make it work the best. I knew this would happen. I'd start again and then be embarrassed about not commenting enough. How are you?? Happy Birthday, Cathy! Hope its a good one for you!